When the parents are out, the children came out to play! This was what happened to us on Saturday, well, almost! My parents were off to Jordan with some relatives, leaving us siblings to settle for our own weekend. So we arranged for all to come over to my place for dinner. It was almost like a "given" arrangement. Why? Because elder sister stay alone, she would definitely need help if she need to cook for so many of us. Third sister's (younger) place has no free parking as she is living in HDB. Youngest sister's house too small to accomodate all of us, plus she doesn't cook. So naturally, it'll have to be my place-I have a helper & I cook & bake. The best part of Saturday's gathering was, it was almost like a sisters' gathering! The husbands had other appointments/comittments! Even my spouse left to attend a wake after dinner. So ended up, the four of us, plus one of my sister's lady colleague were home (and with the children and domestic helpers, of course)! We ended up watching "Red Cliff II" DVD! Ok, I think most of you would like to know what I cook or bake on Saturday. I wondered if I haven't been baking much during the weekdays, ended up, I was pretty lazy on Saturday. I didn't do much though! :p These were what I did. 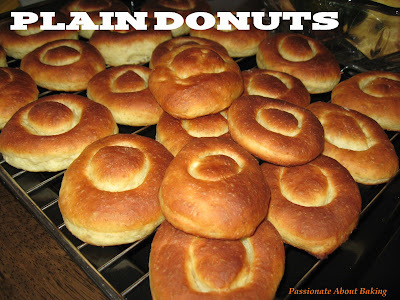 Donuts: The not-so-fantastic JL Donuts that turned tough the following day! Hahaha... 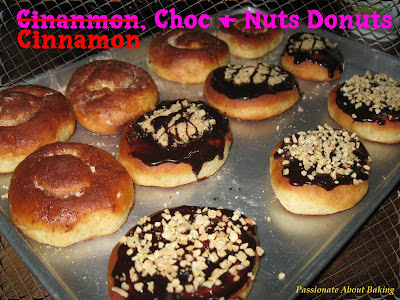 I used my previous recipe for these baked donuts. 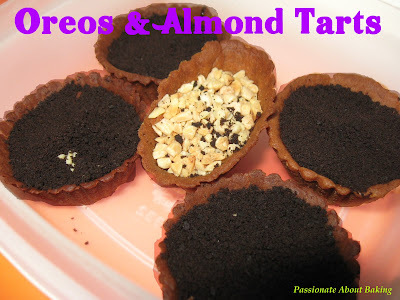 The flavours I made were: Oreo, Cinnamon, Chocolate with Hazelnuts and Chocolate with Almond Nibs. 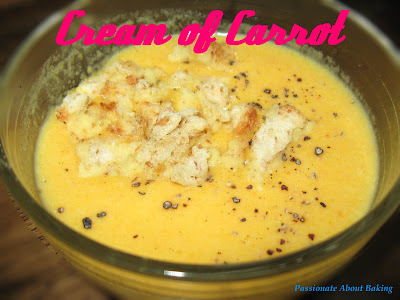 Soup: First time I tried this Cream of Carrot soup. I must say, the result is really good! I've got praises on this soup, even my hubby said this is really good. Sprinkle some black pepper and home-made crotons, it's almost like "ABC" cafe! The recipe has been provided below. 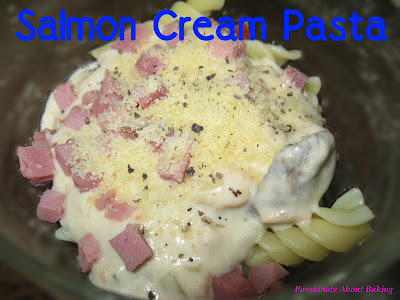 Pasta: Also for the first time, I tried making my own cream based pasta sauce. Not very successful though as it was not salty enough. I thought just modified a little from the cream of carrot soup recipe, cannot be too far wrong right? Hmm... it will be good if I added a little salt as I didn't add any. But besides being salty, there is the salmon taste. I added mushrooms and salmon to the sauce. If topped up with parmesan cheese, the taste, I thought will be good enough. Perhaps, I should have added some shredded cheese to the sauce to make it more cheesy and creamy. Good attempt, I thought, for the first time. 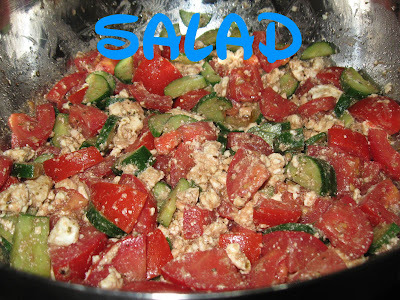 Salad: Very nice salad contributed by my sister's friend. Really nice, but sinful! 1. Sauté the onion dices in the butter until they are tender and translucent but not browned. 2. Add the flour and stir and cook until a soft paste has formed but not browned. 3. While still cooking, pour in 1/2 cup of the stock while stirring. 4. Gradually add the rest of the stock, stirring to make the mixture is smooth and not lumpy. 5. Continue cooking until the mixture is bubbly, then add the carrots and celery and cook until they are soft enough to mash easily, about 20mins. 6. Puree the mixture until it is smooth. (I used my Philips blender and it was done in no time! I put the whole blender into the pot to puree! I'm so proud of the blender!) I turned off the fire before I pureed. 7. Add salt to the puréed soup, if needed, to taste. Add the cream, if required. For me, I omitted the salt as the chicken stock was good enough. I added half a cup of cream to the soup to thicken it slightly. Heat the puréed again if salt or cream is required. Otherwise, it'll all be done at step 6! Wow, what a feast! 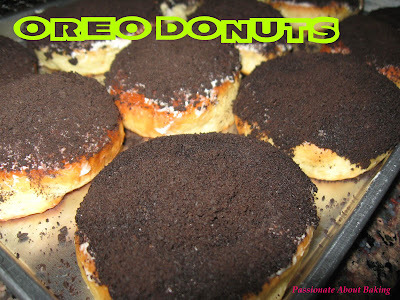 Everything looks delicious--especially those oreo doughtnuts! Jane, I so envy you being able to share fun cooking times with your sisters! Me being abroad most of the time, I hardly see my sisters *sob*. Hope you & your sisters have a wonderful time always! 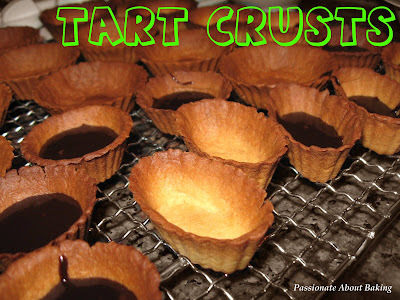 I like the oval shape of tart crusts you've made, it look pretty!